Multi-Coated 62mm Close-Up Lens Filter / Macro Lens Optical Filter +8 : allputer.com - Accessories for all your Portable Electronics & Computers! Every camera has a limitation of the minimum distan for shooting the picture. That means you cannot go closer to the object more than the distance ecommended by the manufacturer. These close up lenses enable you to get much closer than the minimum focus of a standard camera lens - mere inches from the subject! The Close-up Lens Set is for taking pictures of flowers, small collectibles, coins and stamps, insects, small creatures, or anything small that requires up-close detail. Each close up lens maintains resolution and picture clarity while magnifying image size. - This macro filter set consists of 3 close-up filters allowing the photographer to achieve professional results with high quality optical magnifying glass cutting down the close-focusing distance of the lens. 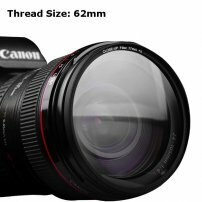 - Compatible with any filters that are 62mm in diameter (For all Sony, Canon, Nikon, Olympus, Pentax, Panasonic, Sigma, Tamron, Minolta, and other manual lens etc). - You can use the filters individually only. - Vagnetting may happen under some situations.